It is Spring Break here for my children this week and we have been enjoying a little bit of sunshine and mostly, a lot of rest and relaxation. It has been amazing to not have a schedule or anyplace we really need to be. I promise we haven’t been complete slugs, and have also been using the time to craft, plant and generally get ready for Spring. 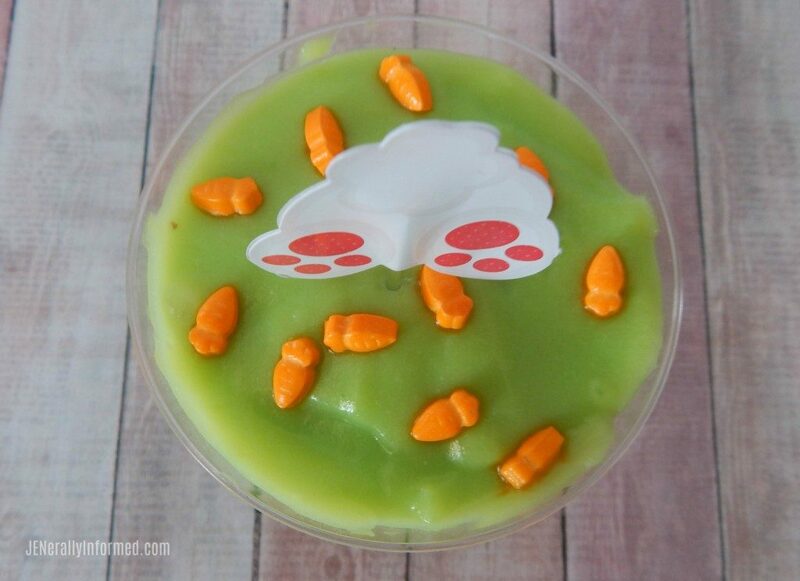 This week my littlest girls and I crafted a really cute Easter Egg Hunt In A Cup Treat, and of course we love sharing our cooking creations with all of you! Isn’t this cute?! It is also super simple to make! Besides the wait times on cooking the cake and mixing up the pudding, it takes little to no time to put together. Easter Egg and Carrot Small Hard Candy- You can grab these at any store during the Spring-time months. Especially look at your special Spring end-cap displays at your big box stores. Spring Themed Cupcake Toppers- Again these types of cupcake toppers are everywhere during Spring from places like Walmart to Michael’s and your local grocery store! To start, first make your pudding. Making sure to add your green dye once the pudding is firm enough. Then place the pudding in the fridge to cool. Next start on your chocolate cake. Follow directions and once the cake is done let it cool down as well. Crumble up small pieces of the chocolate cake and put it into your clear plastic cup. I filled the cup about half way with the cake mixture. Then sprinkle or dump in (like my girls did) the little candy Easter eggs. Lastly, cover the top of the cake and candy mixture with a good sized dollop of your green pudding. 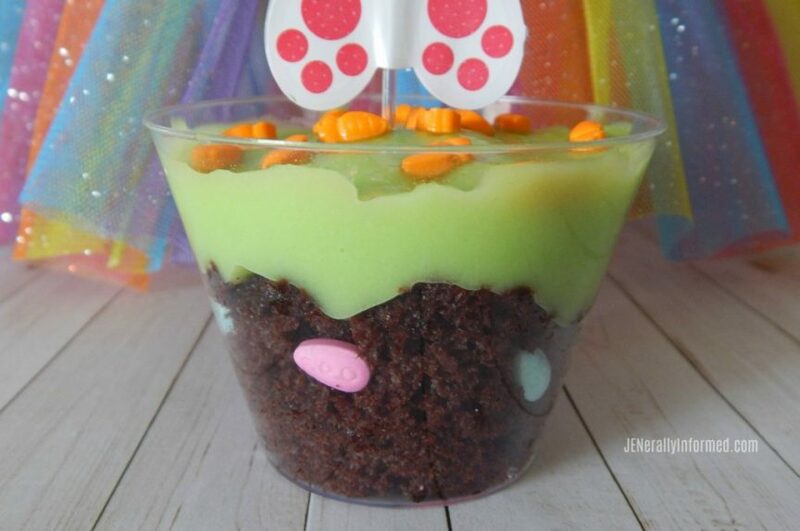 To complete this masterpiece, sprinkle the top of the pudding with your small carrot hard candy pieces and insert your cupcake toppers. Voila! I am thinking making these would be easier than the whole dying the eggs bit and waiting for the Easter Bunny, but….. Here is a printable copy of this recipe for you as well. 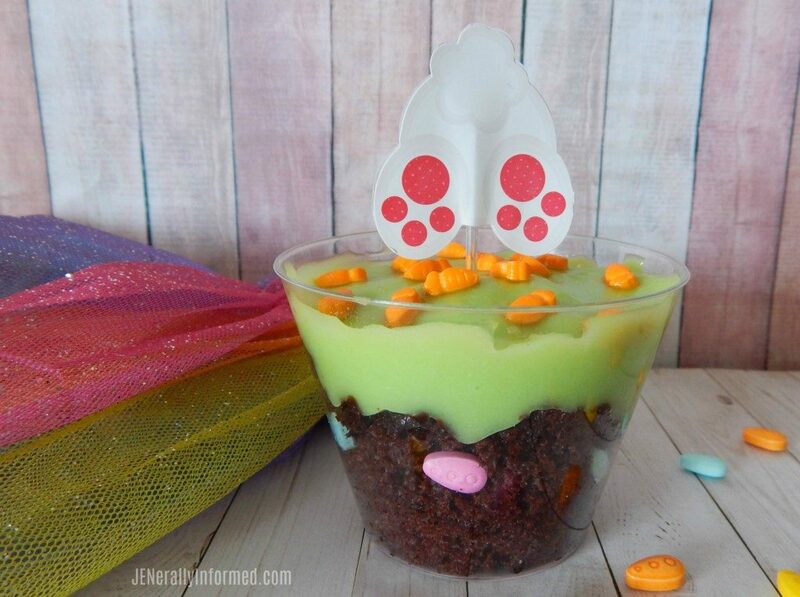 Enjoy an easy to make Easter egg hunt in a cup treat! Prepare vanilla pudding according to directions. Once consistency is firm enough add a couple of drops of green dye. Place the pudding in the fridge to cool. Cook chocolate cake according to the directions and let cool. 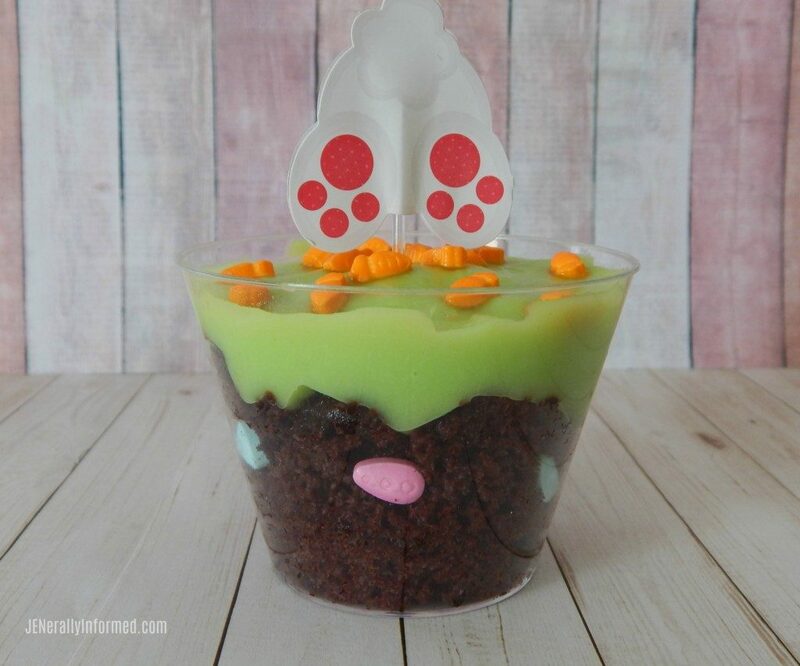 Fill clear plastic cups about halfway full with crumbled chocolate cake pieces. 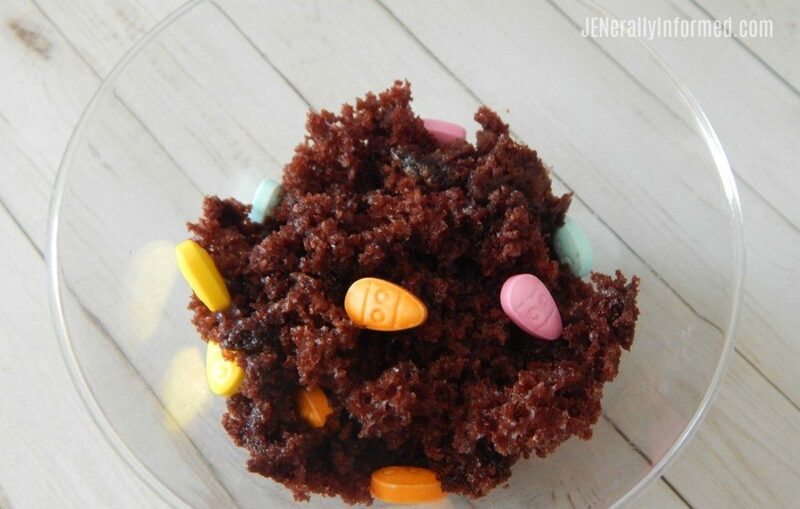 Sprinkle Easter egg candies into the cup of chocolate crumbles. Spoon and spread a good sized dollop of green pudding onto chocolate and candy crumble mixture. Top with additional candy and a cupcake topper. Thanks for popping in and happy Spring! Thank you and happy egg hunting! This is the cutest ever! I love a good Easter egg hunt.. and such a yummy and contained one is borderline (or over the borderline) genius. It always blows my mind that you have spring break now, and we have it in late April. Even though it happens every year, I get amnesia about it. Genius eh? I like it! Hope you and your peeps have many happy Easter egg hunts this season, and a few in a cup! This is such a cute and clever idea. I pinned it! Thanks for sharing. I think my nieces and nephew would really enjoy this. Thanks Lauren! Happy almost Spring! 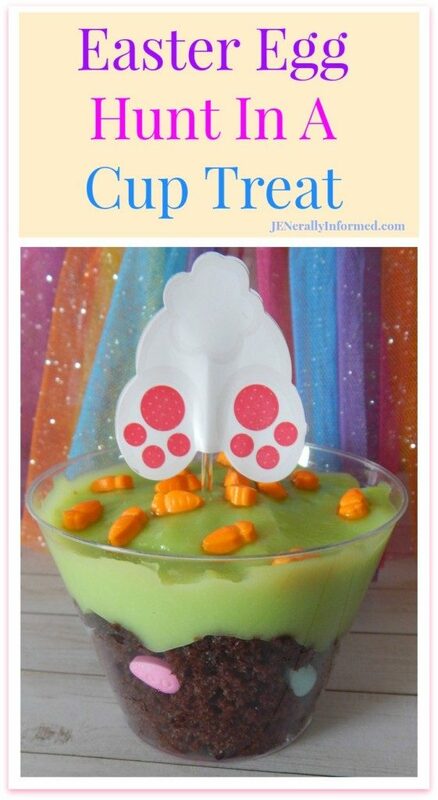 Those treat cups are so cute! Hi Jen, there is nothing wrong with having a little lazy time! Enjoy taking it easy… These are like little Easter trifles. A big thumbs up from me!